I got a call from a neighbor telling me her dog bit a kid and asking for help in getting the dog under control. It was a dog that I had seen the night before. He had gone trick-or-treating with Bruno. 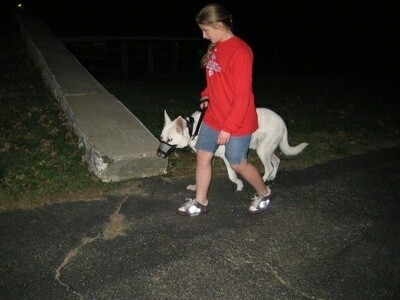 When we had first headed out for the night the dog had refused to walk with his owner, the dad of the family. The dog sat down and put up a loud protesting fuss. When the owner tried to coax the dog to begin walking, the dog bared his teeth at the owner. It was not until the 17-year-old son decided to walk along that the dog started to walk, however the dog insisted on being in front of both of his owners during the walk. During the walk, the dog was whining in a very anxious way. Amie and I headed over to see if we could help. We knew we had to be careful. This is what dog psychologist Cesar Millan (the Dog Whisperer) calls a “red zone case,” because the dog bit someone, drawing blood. 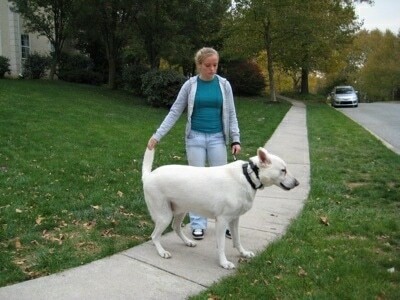 We also found out the dog would sometimes growl at the family's own 10-year-old child. Luke was a white German Shepherd that not only believed he owned his family, his home and everything around him, but he had bottled-up energy from lack of exercise. He was rarely ever taken for walks. He saw all humans as his subordinates; they were all under him and he was their leader. The dog appeared to be OK so long as the humans did exactly what he wanted. As soon as someone challenged him, for example, asking him to sit when he didn't wish to, he would put up a protest, refusing to listen. If he felt like listening, for example, if he was offered a treat, he would listen because it benefited him to do so. However if you asked him to do something and he had no desire to do it, he would not listen. 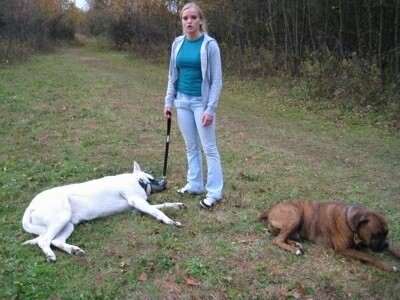 The owners got into the rut of allowing him to do as he wished, and when he was corrected it was either done in a passive way or done in an angry way and the dog would pee. The owner was still very upset from the thought of her dog biting a child. We knew the best way to get the dog to see humans as his pack leader was to take him for a pack walk. However, Luke refused to leave his home. It was very clear Luke owned his human family, especially the lady of the house. This dog had already bitten a child and from the way he was protesting walking away from his home, I decided he absolutely needed a muzzle to keep the humans around him safe.The owner got into her car, drove to the pet store and bought a muzzle. Video of Dog Refusing To Walk. We had brought Bruno with us and not even Bruno could get Luke to go. We waited out on the street corner until the owner returned and put the muzzle on Luke. We did not want to walk him back to his home because that would be giving the dog what he wanted, making him mentally stronger. We did our best to keep his tail from going between his legs in an attempt to help him snap out of his negative state of mind. 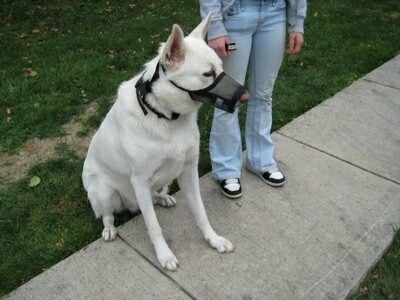 The owner put the muzzle on Luke and went back home. 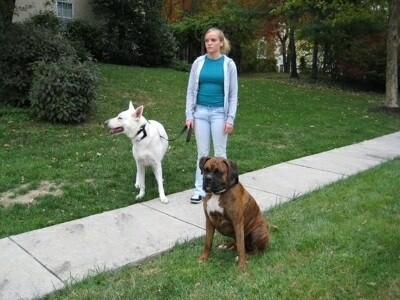 She was very visibly nervous, making it almost impossible to get the dog to move on. We tried food. No go. He was not food-motivated at all. Video of the dog protesting. He was so loud people were coming out of their houses mistaking his reaction for us abusing him. We had tried to get him to walk in his own neighborhood for a good hour. We knew we had to try harder to get him to walk, however, we were drawing a crowd and the people watching had no idea why the dog was acting out. Luke's loud protest had made it appear he was being hurt when in reality he was not. He was telling us what he wanted and what he wanted was to go back to his followers. We decided to call the owner back and get her to drive the dog to my farm. At this point the owner had another obligation with her son and left Luke with us. We worked with him for two more hours wishing Cesar Millan was there to give us pointers. This was not an easy task. The only thing we wanted was for Luke to walk. That was it. For two hours straight Luke refused, protesting up a storm. Thank goodness for muzzles! We knew if we allowed Luke to win this battle he would be that much stronger, that much harder for this family to get under control. Luke needed to let all of his negative energy drain and he had years of it bottled up inside. We were able to get him walking for short bits before he would begin to flop around in another protest. After his protest he would lie down and appear to have submitted, however he would still refuse to walk for any length of time. We kept pulling his tail out from under him to help him get into a better state of mind. A few times Bruno tried to assist us, however we told Bruno to leave it. It was not his place to correct this dog. We would handle it. Each time we told this to Bruno he accepted it and walked away. After a total of four hours of working with Luke he finally gave in and started to walk. That was all we wanted of him. It was dark so we got pictures but were not able to get video, which was a shame because Luke was walking so well. We walked the trails for 40 minutes. What a good boy he suddenly was. We walked him to water and allowed him to get a drink, then kept walking him. We called the owners and had them come over. One by one we taught them how to walk the dog. We taught them how to go through doorways and gates first. I lent out some Dog Whisperer "Mastering Leadership" DVDs and printed out articles on how to be a pack leader. The family has plans on getting the box sets of the Dog Whisperer to help them learn how to be the best pack leaders they can be. They have another toy dog at home and realize they need to be pack leader to that dog as well. The family can no longer see the dog as a human. This dog can no longer jump up on people without being corrected. He can no longer jump up on the human's laps when they watch TV. He can no longer nudge them to be petted. He can no longer beg for food from the kids. They can no longer give up when they tell the dog to sit and he does not listen. They must follow-through and make him sit when commanded. The youngest child can no longer run to the dog and hug him when she is upset about something. While this had comforted her as a human, it made the dog see her as weak. The family can no longer pass off growling at family members as the dog being pestered and to leave the dog alone. Growling can never be accepted. They can no longer pet the dog when he is anything but calm and submissive. The family plans on taking him for daily walks where he is made to walk beside or behind them. This was a real eye-opener for the family into the importance of seeing dogs as the canine animal that they are and treating them accordingly. Note: Please contact a dog behaviorist if your dog has issues such as Luke's. The dog behavior company, Bark Busters, is a good place to start.